August 9, 2015 – Park City, Utah – Young American Joe Dombrowski (Cannondale-Garmin) fended off the top cyclists in the world and earned the top prize at the 2015 Larry H. Miller Tour of Utah in front of huge crowds in Park City on Sunday. “It was a great week for us as a team. I'll definitely remember yesterday's stage, winning the stage and taking yellow. It was really a great team effort today. They did a super job controlling the race going into the final climb, and then put me in the right spot, and from there, it was just follow everybody,” said the 24-year-old Dombrowski, riding his first year with Team Cannondale-Garmin. 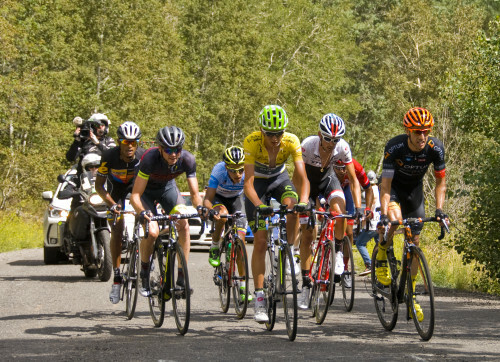 He finished fourth overall at the 2012 Tour of Utah while riding for the Trek-Livestrong team. Stage 7 presented by VLCM/Barracuda found a select group of riders battling for the overall victory on the Hors Category climb of Empire Pass, one of the hardest climbs in the world, followed by the thrilling descent into Park City. Two riders escaped atop the 10-kilometer climb with Australian Lachlan Norris (Drapac) and American Brent Bookwalter (BMC). Blasting downhill at speeds reaching 60 miles per hour, Norris out dueled Bookwalter for the Stage 7 win. Eritrean National Road Champion Natnael Berhane (MTN-Qhubeka) led the seven-rider chase group across the finish line for third place, 20 seconds later. Dombrowski finished ninth at the end of the chase group to close the deal on his first stage race victory. With not only the stage win but all the jerseys up for grabs, the final stage of the Tour of Utah was set for a showdown. Though Dombrowski had shown dominance in his victory on the Queen Stage that gave him a 50-second lead in the general classification, any sign of weakness on Empire Pass could result in minutes lost. The first attack in the 78-mile stage was appropriately made by Park City native Tanner Putt (UnitedHealthcare). Though his first flyer was neutralized, Putt did make it into the 12 rider breakaway that escaped in the first 10 miles. Along with Putt, the break included Rob Britton (SmartStop). Luca Chirico (Bardiani-CSF), Carson Miller (Jamis-Hagens Berman), Angus Morton (Jelly Belly), Sam Spokes (Drapac), Taylor Phinney (BMC), Edwin Avila (Team Colombia), Griffin Easter (Airgas Safeway), Songezo Jim (MTN-Qhubeka), Tyler Magner (Hincapie) and Jack Bobridge (Budget Forklifts). With Britton the highest-placed rider at over nine minutes, Dombrowski and his teammates settled in at the front of the field, letting the gap go to the four-minute mark in the next 20 miles. The first attack in the peloton came on the lower slopes of the first KOM of the day, Wolf Creek Ranch which gains 1,108 feet on a 2.5-mile long climb. Though the move was brought back before the top, it did decrease the gap to less than two minutes. Putt took advantage of the fast descent to Midway to separate from the break. The two-time Under-23 road race champion pushed his gap to over the minute mark to the rest of the break for the next 10 miles to the bottom of Empire. Britton jumped from the chase group to catch and pass Putt while behind the battle was starting for the general classification. Woods put in a massive acceleration, forcing a selection. With nine miles to go, Britton had a 45-second gap on a very elite group which included Woods, Dombrowski, Frank Schleck (Trek-Livestrong), Berhane, Bookwalter, Norris, Robbie Squire (Hincapie) and Daniel Martinez (Colombia). Throughout the climb, Bookwalter yo-yoed off the back, fading slightly on the steeper pitches and clawing his way back up. Chris Horner (Airgas Safeway) along with three other riders connected with the group just before Britton was reeled back in the final kilometer of the climb. Bookwalter pushed the pace on the descent, getting a small gap to Norris on the tricky switchbacks. But Norris reconnected later and the two made it into Park City together to sprint it out for the win. Dombrowski claimed the overall victory at the Tour of Utah, with a 50-second lead on Woods. Bookwalter moved up to third overall in the general classification with his second-place finish on Stage 7. Prerace favorites Fränk Schleck (Luxembourg) of Trek Factory Racing and Chris Horner (USA) of Airgas Safeway Cycling Team finished fourth and fifth, respectively. Salt Lake City resident Robbie Squire (USA) of Hincapie Racing Team retained his ninth-place overall. Park City’s Tanner Putt ended up 52nd on the stage at 9:14 back, and 82nd overall. Utah resident Erik Slack finished 79th on the stage at 15:39 back, and 83rd overall. Chris Putt dropped out during Stage 4 due to a crash the day before. Berhane was awarded the Vivint Most Aggressive Rider jersey. Greg Daniel (Axeon) successfully defended the Utah Office of Tourism King of the Mountain Leader jersey. Placing eighth overall put 19-year old Martinez in the Subaru Best Young Rider jersey. Fans selected Phinney as the America First Credit Union Fan Favorite in the Best Overall Fan Favorite category. Team Colombia won the Washakie Renewable Energy Best Team classification. The 11th edition of the Tour of Utah, known as “America’s Toughest Stage Race” included 712 miles of racing and 51,442 feet of elevation gain for the 2.HC stage race. The seven-day race saw four different riders, from four different teams, claim the yellow leader's jersey. The race also showcased young and up-and-coming riders taking stave victories and classification jerseys. It all started in Logan when Kiel Reijen (UnitedHealthcare) sprinted to the win from a breakaway on a rainy Stage 1. Jure Kocjan (SmartStop) took Stage 2 from a reduced peloton in Ogden but Reijnen keep the leader's jersey with his fourth place finish. Brutal climb up Bountiful Bench and huge crowds highlighted a thrilling finish for Stage 3 won by 20-year Logan Owen (Axeon) in Bountiful. Stage 4 saw the first bunch sprint and a change in the race leadership. Eric Young (Optum) launched his sprint early on the uphill finish in Midway. Third in the stage, Kocjan took over the yellow jersey. Woods out-climbed everyone to win Stage 5, the brutal Salt Lake City circuit and took over the leader's jersey. Dombrowski dominated the Queen Stage on Saturday, climbing into the biggest win of his career at Snowbird Ski and Summer Resort. Norris closed out an exciting seven days of racing with his close sprint in Park City. At the post-race press conference in Park City, Jenn Andrs, the executive director of the Larry H. Miller Tour of Utah, announced that the 2016 men’s professional stage race will take place August 1-7. “It exceeded our expectations this year with some tremendous winners and some wonderful racing. I'd like to recognize our champion Joe Dombrowski with the Cannondale-Garmin team, and also the winner of our women's race, Hannah Barnes from UnitedHealthcare Pro Cycling Team. 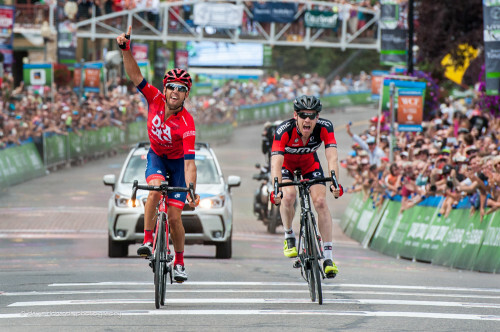 Both are tremendous champions of the Tour of Utah and we look forward to them coming back in 2016,” stated Andrs.